Okay! So about those delicious cookies. This bad boy came out of my mother’s handwritten recipe book so as for where it initially came from, not a clue. One thing I do know is that they are EASY PEASY and yummy to boot. The only difficult part is not eating them all in one go. Preheat oven to 375 degrees. Combine peanut butter, both sugars and butter in a mixing bowl and cream until blended. Beat in milk, egg and vanilla. 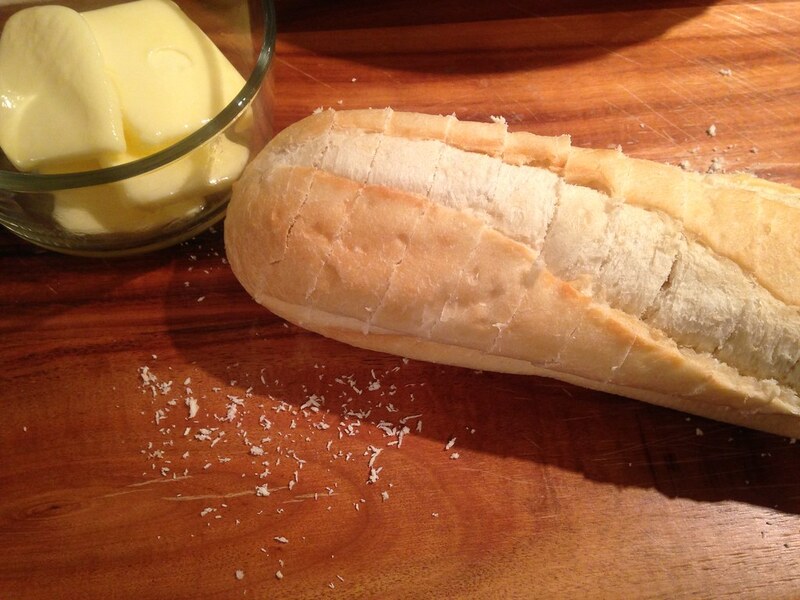 In a separate bowl combine flour, salt and baking powder. Combine and mix with the peanut butter mixture and mix until smooth. 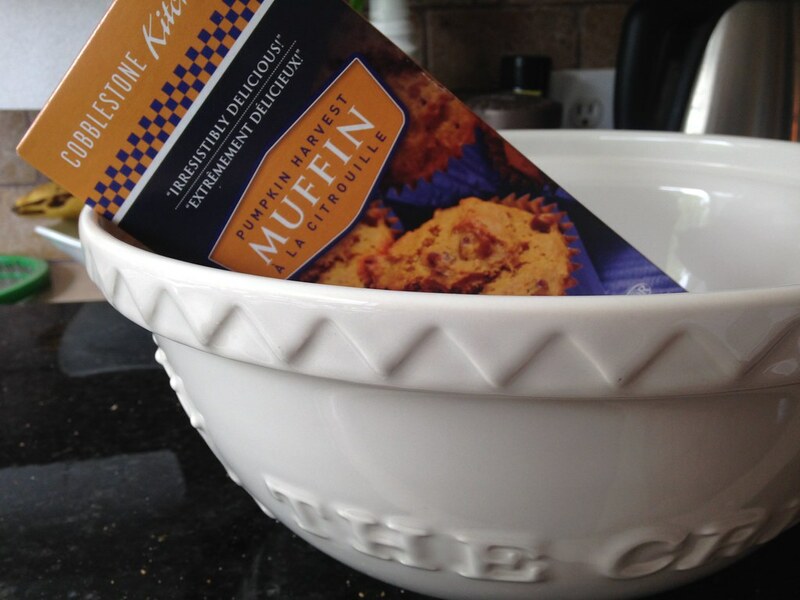 On an ungreased baking sheet (or use parchment paper) spoon out tablespoons of the cookie mixture and roll into balls. Place them two inches apart as the baking powder will make them rise and expand. I safely with between 6 and 8 balls on a making sheet, depending on the sheets size. Oh and word to the wise, the better the baking sheet, the less likely it is the bottoms of your cookies will burn. Press each ball down with a fork and bake for 10 minutes. I recommend baking each sheet separately, on its own. This takes more time and obviously more energy from your oven having it on longer, but it will result in a better quality cookie, I promise you! Remove from oven and allow to cool on cooling rack for ten minutes. 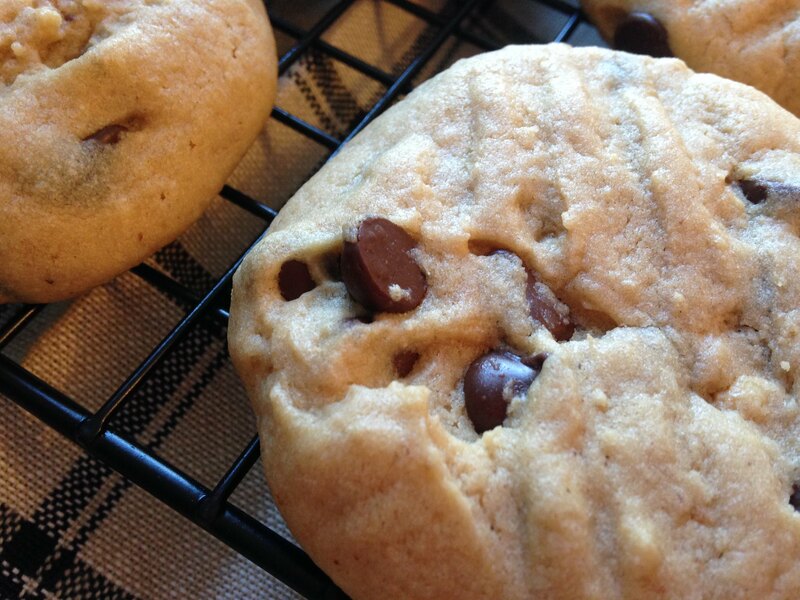 These babies are best when they are soft and warm so do not let them sit too long without a quality taste test! Ah Mondays…. I remember that in every professional position that I have ever had, Mondays are always one for the books. It’s hard to shake off the weekend and get your head back in the game. Now I find that being a mom, it is no different. Mondays are hit or miss. Sometimes they rock, sometimes they are disguised as satin himself in the form of my darling little girl. This Monday my friends, was one of those days. Of course by DAY, I mean it all started at three am. I think we were awake from three until six and that also included momma attempting to sleep on the nursery floor for a good hour. There was no pain, no hunger and no wet diapers, just a whole lot of playtime dance party fun. For one. Eventually at daybreak we both drifted off to sleep, HARD. My sweet husband woke up with her somewhere around eight and I continued to sleep until ten. Bless his heart. We somehow managed to make it on time to our Tiny Tunes sing along at the library at ten thirty when the insane behaviour continued. 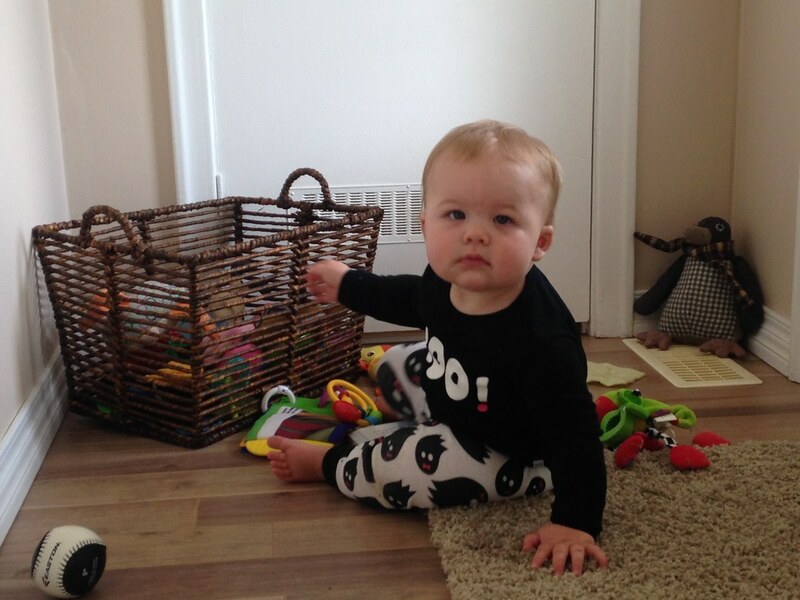 Rather than adhere to the rules of sitting in a circle and happily sing Incy Wincy Spider, my little angel preferred to scramble around the room, steal other baby’s toys and hide shoes. If I wasn’t so tired it would have been comical but this momma was slightly sleep deprived! I digress…. We arrive home only to discover that nap time is not in the cards for the day – someone is opting out of nap time. Instead a giant sh#t occured – one of those ones where you reach over to discover ONE LAST WIPE on hand. I refasten the mess so that I can run to the other room and grab reinforcements. Upon my return I find my sweet little girl with her hand firmly jammed in the side of her diaper, twirling her poop in a sleepy daze. I can’t help but think this situation really could have been avoided. Once all cleaned up, the only thing I feel like doing is making cookies. 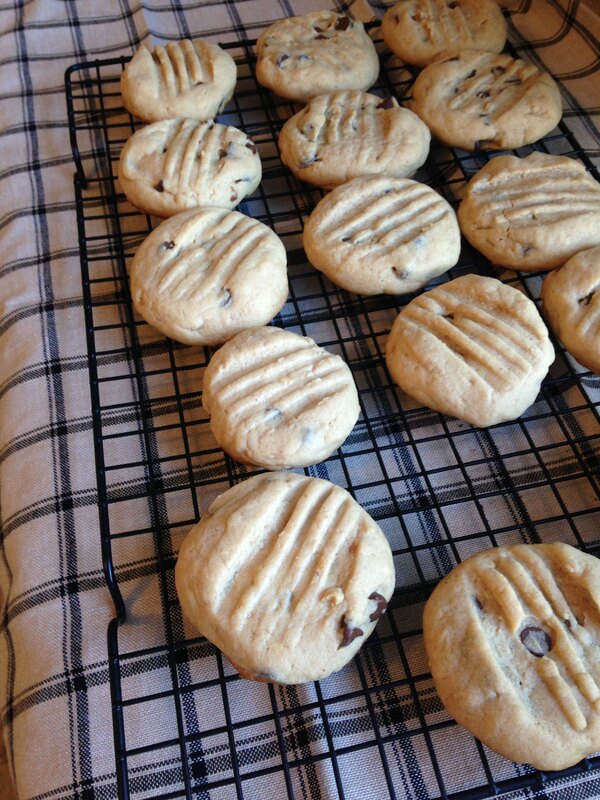 Gooey chocolate chip peanut butter cookies. So that is what we did. I made cookies and Hallie made a giant mess of toys in my kitchen. On the plus side, I discovered a fantastic recipe! Rather than talk about yumminess in the same area as poop though, I will include a post and pictures next for the next time you have one of those ‘Mondays’ and need a cookie break. Cheers to the week ahead friends! Some cuteness to redeem herself….. I can’t believe we have already been living in our new home for almost a whole month! It still feels like it was just yesterday that we were packing up our townhouse. Moving is always a hassle and unpacking seems to be ongoing, however it really is starting to feel like home here. The kitchen is my favourite place to be. It has a fresh farmhouse vibe and giant windows that overlook the big back yard. The kitchen is always the heart of the home so that is where I concentrated my efforts first. I started by updating the hardware on the cabinets. The cabinets themselves were old but freshly painted white so they were fine as is. The copper knobs had to go and I found some dark vintage ones and roughed them up with a nail file to give them even more of a distressed look. 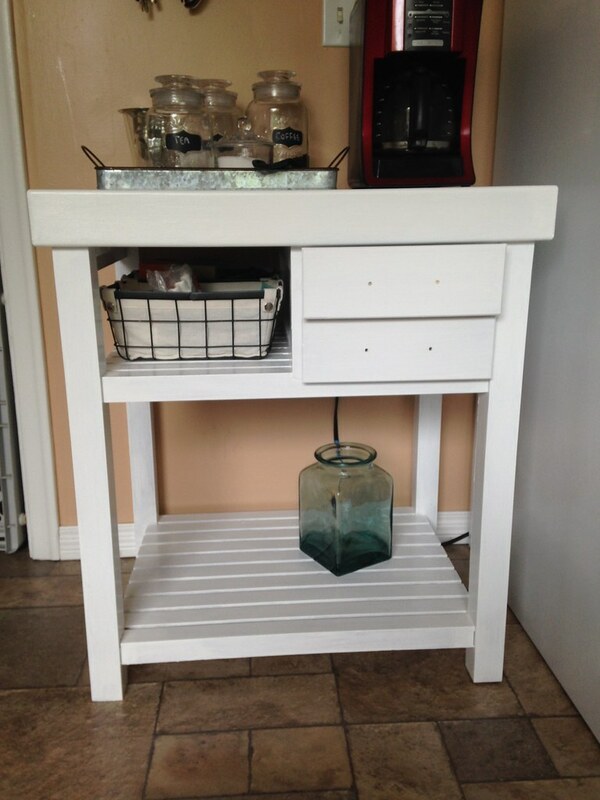 We had a bamboo kitchen island which I sanded and painted white (can you tell I am obsessed with white?). I then converted it into a coffee station which happens to be the most popular place in the house now! I also located a used table for $15 online and refinished it. It is on the small side but so is this house so it fits in perfectly. While I was visiting my mum a couple of weeks ago I snagged two chairs that were the perfect addition to the room. So the kitchen is coming together perfectly! 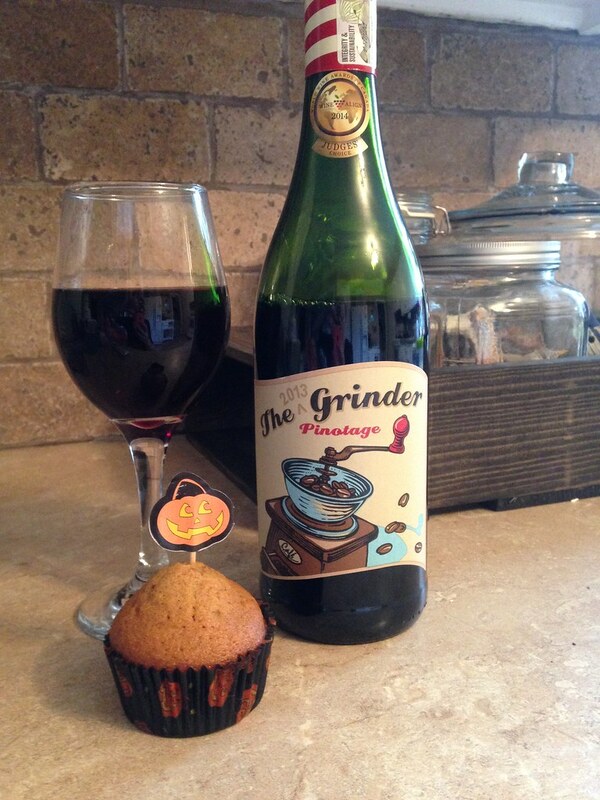 Perfect timing as Fall Baking is upon us and it is time to get cracking on the sweet stuff. 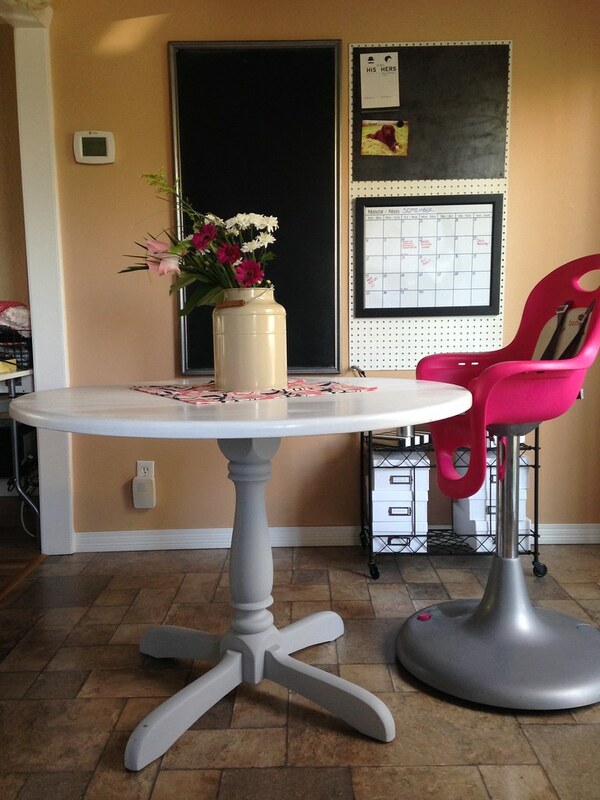 My refinished table; I forgot to take a before shot but it was pretty basic and outdated before I got to work. 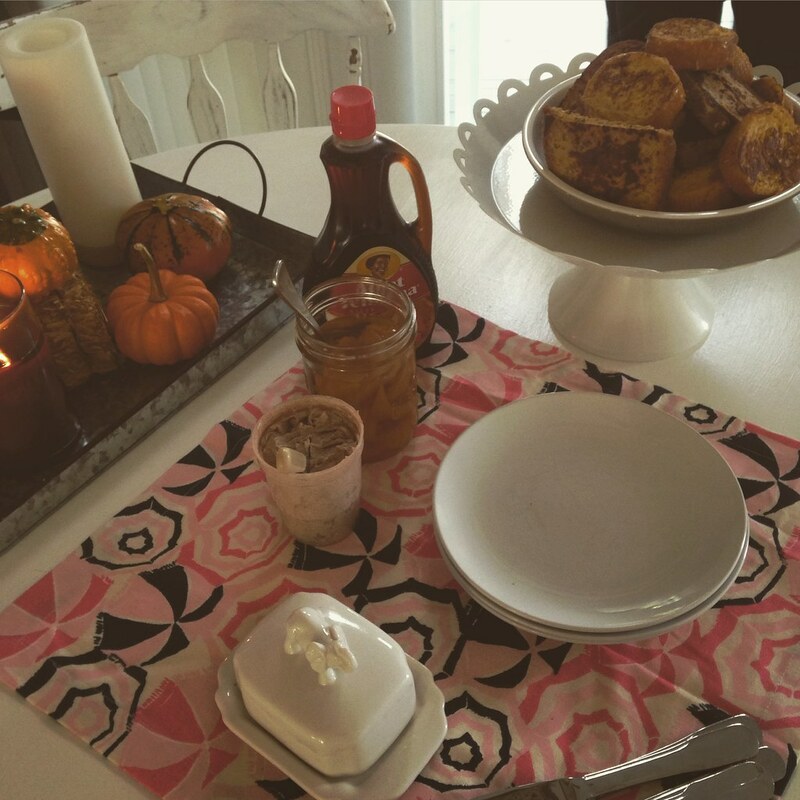 We also broke it in with a big breakfast while my parents were visiting. I am limiting my Fall decor but it’s only a matter of time before the whole house is filled with gourds. Hope you are all having a wonderful Saturday! A rare napping moment has presented itself so I will either follow suit or do some much needed housework. Happy weekend! Hope you all had a great week – Happy Friday! Since having a baby, gone are the days of going out Friday night for cocktails and dinner. I love those E-Cards that say: ‘TGIF! Oh wait, I am a mom.’. So true! However, in our house we tie cocktail hour into making dinner and try to have fun with it every night. Tonight’s special was Via Italia style. One of my all time favourite meals is spaghetti but when I was searching Pinterest to spice up a regular meal, I came across all sorts of variations to your run-of-the-mill noodles and sauce. 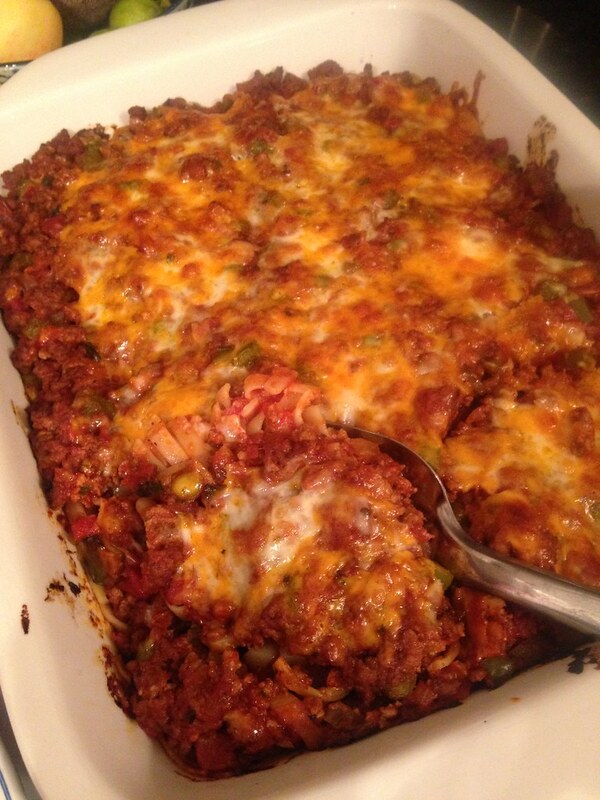 Ladies and gents, I give you Baked Spaghetti Pie! This one is a winner and I suggest you try it at home as soon as you can. After looking at many recipes, I decided there is really no way that you can fail at this dish, and no reason you need to limit your ingredients. Luckily I had been to the Farmer’s Market yesterday and happened to have everything I needed. I suggest sticking to your favourites when it comes to sauce, spices, condiments and oil. 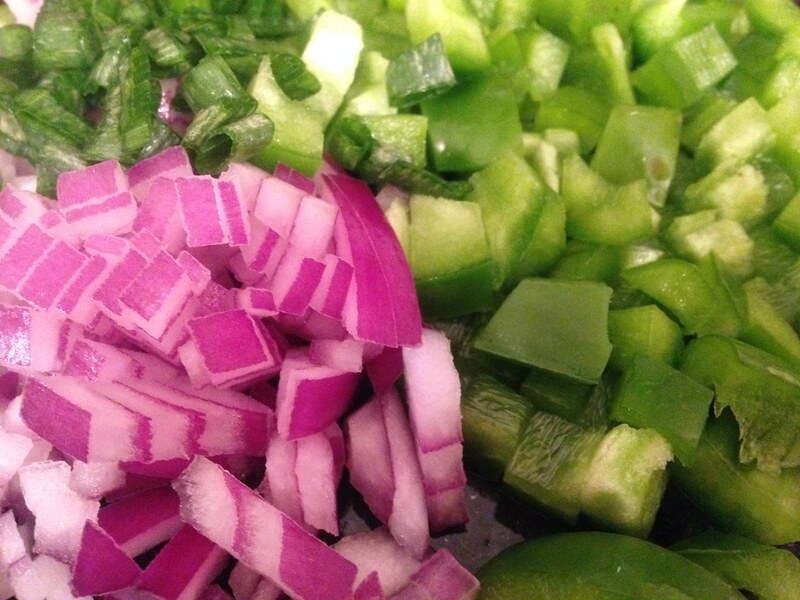 Try to opt for fresh ingredients when possible like green peppers, garlic and red onion. 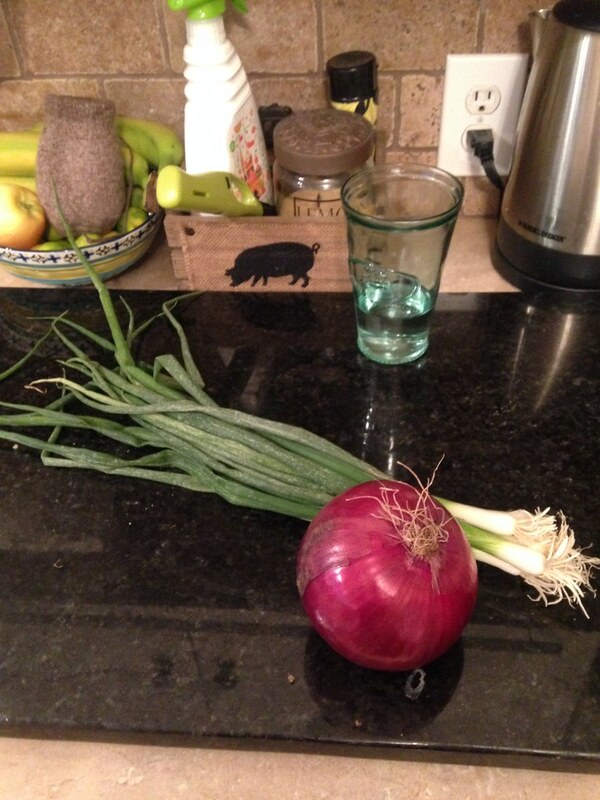 Oh and don’t forget the steroid sized green onions! Boil noodles as you usually would. Spaghetti noodles are perfect however I used fettuccine and really any pasta noodle would be ideal. Brown your beef in a frying pan with oil, adding your chosen vegetables and spices once the beef is cooked. I added diced green peppers, green onions and red onion, garlic flakes, chilies, salt and pepper. 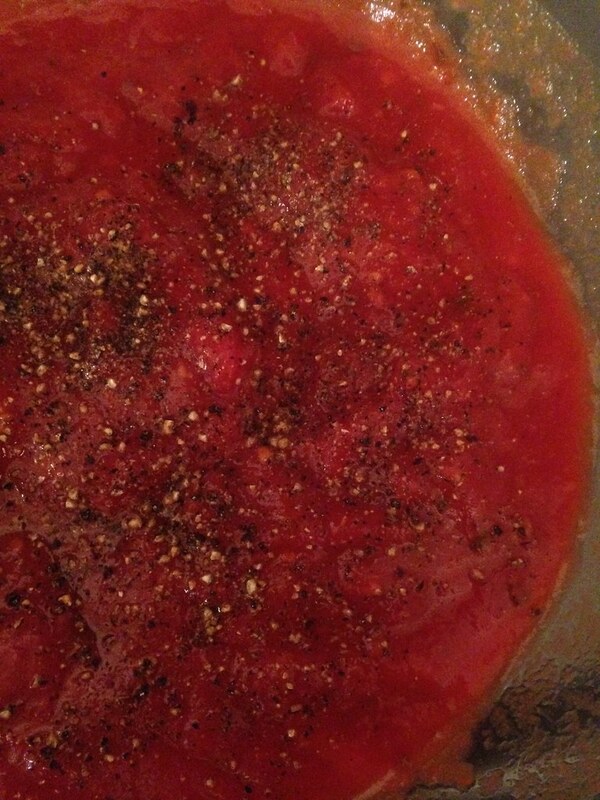 In a separate dish I mixed together my pasta sauce, diced tomatoes and tomato paste. Throw that into the beef and veggie mix as well. In a casserole dish, pour a bit of olive oil and layer your noodles. Grate cheddar and mozzarella cheese. 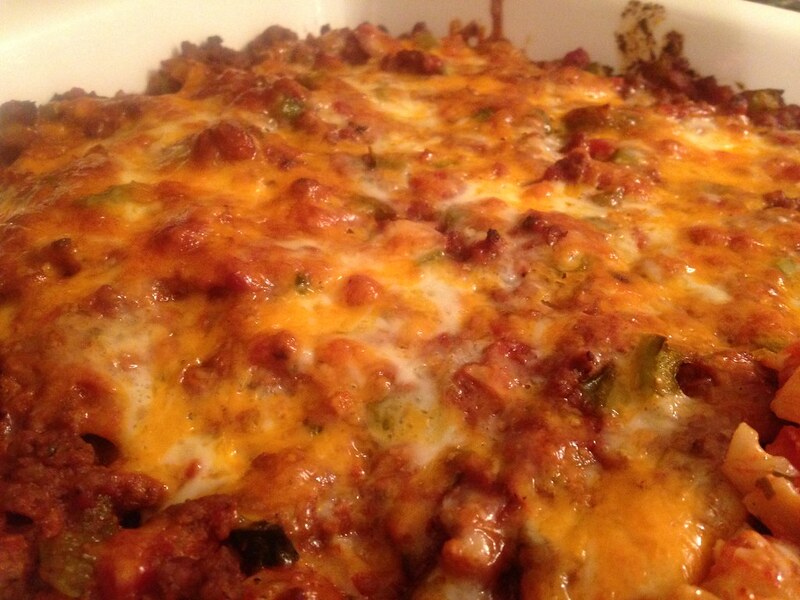 Pour your beef and veg mix evenly over it and then add more cheese. If you eat in this house, you cannot hide from cheese! Bake in the oven for twenty minutes and the top of your ‘pie’ is bubbly and golden. 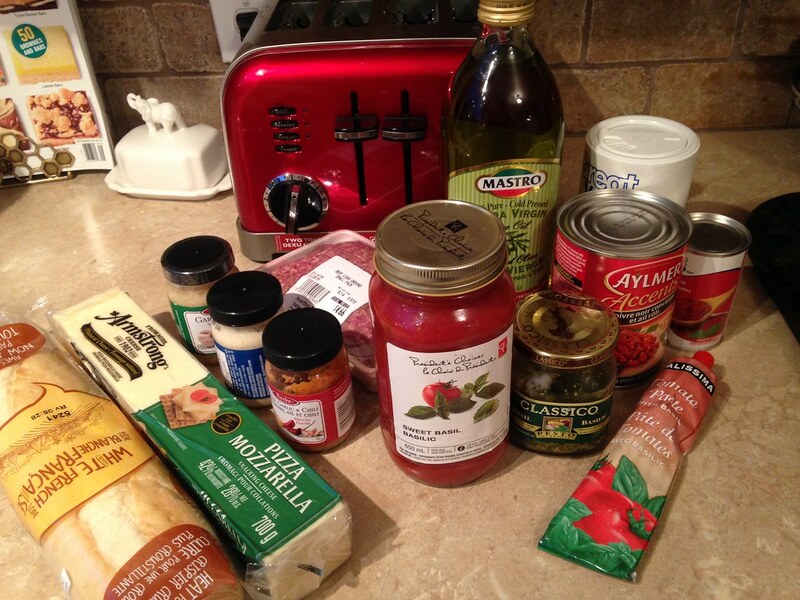 Put on some sweatpants and serve with garlic bread…. and a bottle of red wine if you feel so inclined. Bon appetite my friends! As much as I love Fall fashion for me, baby Fall fashion right now is simply too cute to resist. From cute leggings to parkas, I may very well blow an entire pay cheque on the little kiddo. I just ordered these Carhartt Overalls for Hallie which will be PERFECT for playing in the yard over the next few months. Now that we live in Kamloops we will need to get used to chilly Okanagan weather. It was blue skies and sunshine yesterday morning but also zero degrees! I love the cool weather as long as you are dressed for it and it’s not raining. Won’t miss you, West Coast Drizzle! So here are my top picks for little girl Fall Fashion. Seriously, who can resist a little knitted fox hat? H&M Kids/Baby has some serious cuteness going on. Click here to see their entire Fall collection. My personal favourites included the parka (LOVE!!!!!!!) and the dresses. The pinafore style dresses are perfect for topping a onesie and leggings in the colder months. Babies get to layer too. Shoes are always tricky with chubby baby feet and when the little ones are learning to walk, you want something with a bit of stability yet still a soft sole. These Joe Fresh Ballerina Flats are perfect for where Hallie is at right now in terms of her walking development. They are also cute to boot! Zara Baby clothes are so fashionable, they put parts of my own wardrobe to shame. I love all of the knitted items they are carrying right now and the matching fox hat and mittens are irresistible. Seriously, do they come in my size? Not to mention some caramel leather Mary Janes..
Lastly, our Baby Gap favorite. I swear between myself and Grandma, Hallie has owned this sweater in every size so far since was born. If it has built-in ears on the hood, we have it. 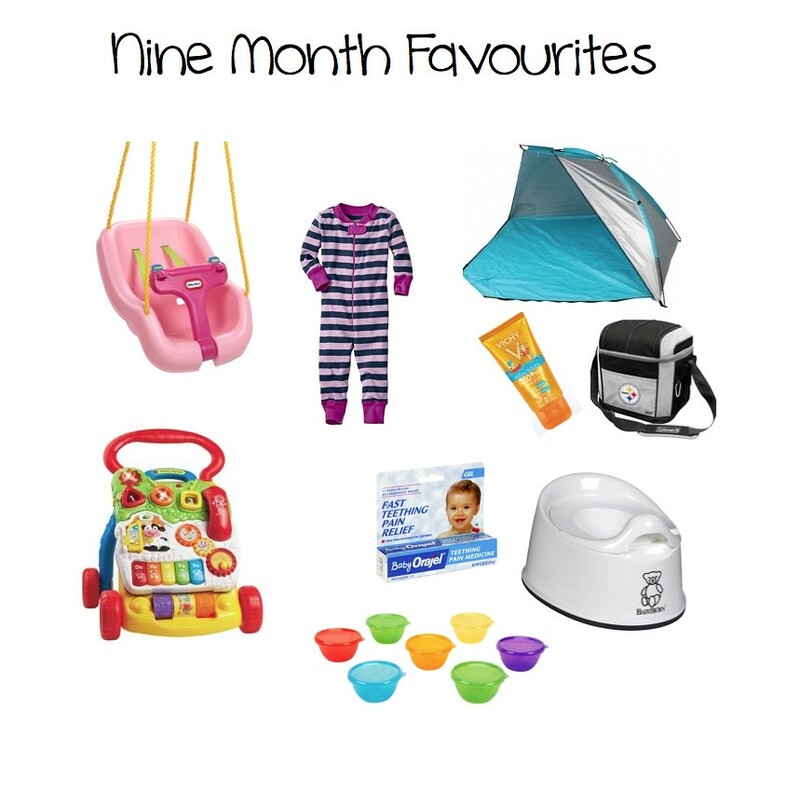 I would love to hear your favourite Fall and Winter necessities too! It seems that Fall has arrived! I know back in Vancouver, talking to friends, it showed up in all of it’s glory the first week of September. Here in Kamloops, it peaked in a little, then buggered off again to give us three days of sunshine and 32 degree heat! But now, it is here. There is a bit of a chill in the air and just enough to make you question your footwear. This annual transition between seasons can be somewhat confusing for the wardrobe; at least I always find that happens. Once you see a few Fall gems in store or online though, it’s easy to find your way with a nice scarf and a good pair of booties. Here is a round-up of my favourites for Fall fashion – some new and some tried and true. We will start with new purchases! On a mini shopping spree, I picked up this William Rast Moto Jacket from Hudson’s bay. It’s a perfect layering piece for Fall. I even wore it with a pretty slip dress to a wedding at the end of Summer. It was the perfect touch on the floral dress to give it a bit of edge. H&M happened to have just about every piece I was after. I love this leather bag as it easily doubles as my diaper bag. It’s large and deep enough to hold diapers, wipes, the odd toy or ten, my wallet, my giant BKR bottle and whatever else I may need for the day. The Heather Grey Tee and distressed skinnies are the perfect go-to mom outfit. Comfy, fashionable and easy to get around in when you are chasing a crawler. The hat is that gorgeous raspberry color that we have noticed pop up all over the place and the felted fabric makes it nice and cozy for those windy, blustery days ahead. I love the boho shawl as well. The stripes and colors make it easy to mix in with other outfits and it’s a great layering piece. Can you tell I like to layer? Lastly,the tried and true pieces from last year. My Jessica Simpson Ballerina Flats are a nice solution when you don’t feel like boots. I’ve paired them up with skinnies and skirts and they are super comfy.The stretchy ankle strap adds a bit of youthfulness to them as well. My Sam Edelman booties are a godsend and lets just say I wouldn’t get through Fall without them. Or Winter. Or Spring…. okay I may be obsessed with booties. What is on your Fall Must-Have shopping list? Nine months was such a fun time with my baby. There is so much happening in a baby’s development at this age. We were still enjoying the fruits of a hot summer when Hallie was nine months old so fortunately, we spent most of this age outdoors. So much time outdoors helped in two ways. Hallie was motoring around crawling, and also trying to walk so being outside doing both of these things allowed her to explore and feel things like grass and dirt, pretty exciting stuff for a kid! All of this time in the fresh air also helped with tiring my energetic babe out. Nine months old was actually a great time for sleep (now enter 11 months where she has no idea what the heck sleep is, nor does she wish to try it out). Below are my favourite items that I found most valuable at this age. Little Tykes Swing – This swing is awesome! It was the first thing I did in our new home when we arrived. Located the perfect tree in the backyard and hung this bad boy up. Pro: We can swing whenever we want. My favourite time is after dinner/before bed, while the weather is still nice. 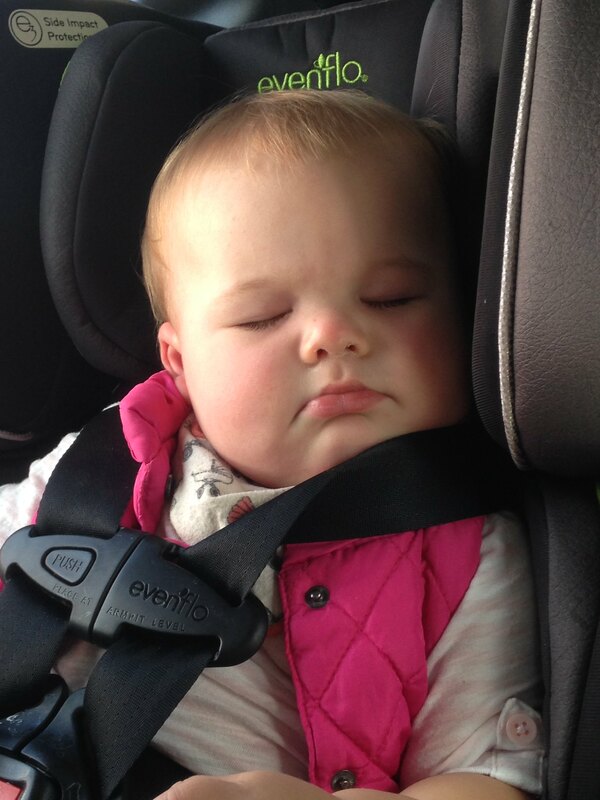 Con: It really takes away from the excitement of going to the baby swings at the park. I guess when Hallie is walking we will be able to do more at the local playgrounds and that excitement will return. Footless Sleepers – I have an exceptionally long baby and even if I buy two sizes too big, sleepers seem to run a little short on her long legs. Footless I have quickly learned it the way to go. I am obsessed with Hanna Anderson sleepers, especially the festive ones for Halloween. Cannot wait to get my hands on some Christmas themed ones! V-Tech Sit-To-Stand Learning Walker – Like I said, my sweet girl is trying her hardest to get going on the whole walking thing. This walker allows her to do just that, she loves it. She surprises herself quite a bit when she really gets moving on it too! Baby Oragel – This one speaks for it self. We cut two teeth in the nine month period and this baby was a life saver, for everyone involved. Babies R Us Snack Cups – These are reusable and are actually great quality! I am still using them. Perfect for some goldfish on the go or when we head out to the park to have lunch. Also perfect for today’s current eating habit: When Hallie refuses to finish her food and I need to pop it into the fridge in hopes of serving it for the next meal! Baby Bjourn Potty – I know. It’s too early. But there is nothing wrong with getting her used to it. We ‘use’ the potty after meals and she has christened it four times now. I know that the road of potty training is a long one but maybe we can get a head start. Coleman Cooler – Like I said before, we were spending a lot of time outside at this age. I bought a larger cooler to take on our park adventures because I still had to keep milk and lunch cool from the heat. This one in particular was a favourite – Go Steelers! Vichy Sunscreen for Infants – There are a lot of opinions about sunscreen for babies. I found Vichy to not only be great for her but also for me. Sun Shade – I bought this sun shade and it is perfect for the beach and park. It is even relatively simple for one person to set up on their own. Saved us on many hot and sunny days! What are your favourite products to use at this age? I will be adding this post to the full list of favourites located here and continuing with ten, eleven and twelve months very soon. I can’t believe it has almost been a full year!